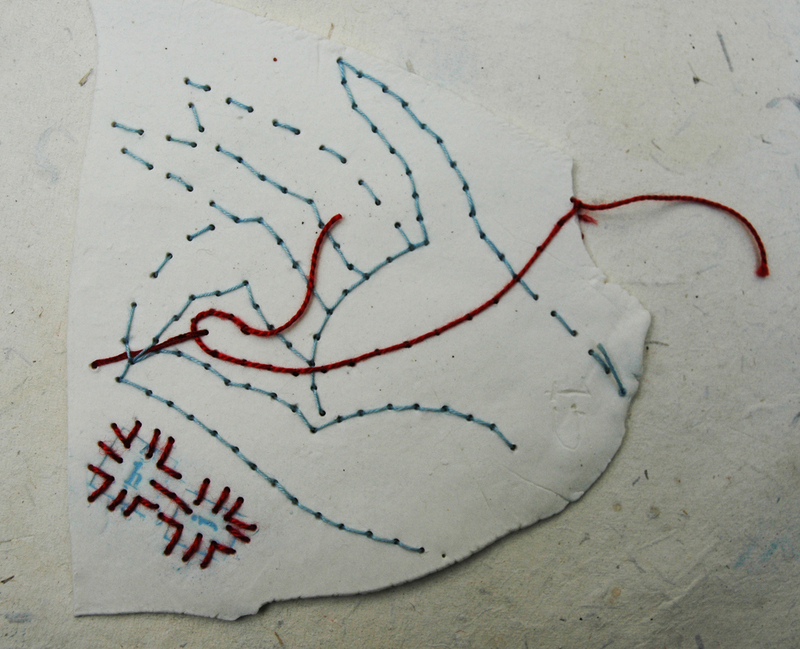 Ongoing practical research with ceramicist Hanne Rysgaard, as part of Stitch and Think project being run at U.W.E. Bristol by the ETC group. Follow the development from first drawing ideas and sampling stages through to the making of a series of stitched, darned, impressed, cut and sewn porcelain plates and dishes. Today I went to Blaze gallery and studio to collect some of the fired paper porcelain samples from Hanne Rysgaard, (see Archive for first Stitched Ceramics post) and brought them to my studio here to colour and stitch. I am primarily testing how much the porcelain shrinks when fired; Hanne calculates at 20% shrinkage but that I need to see what that looks like. 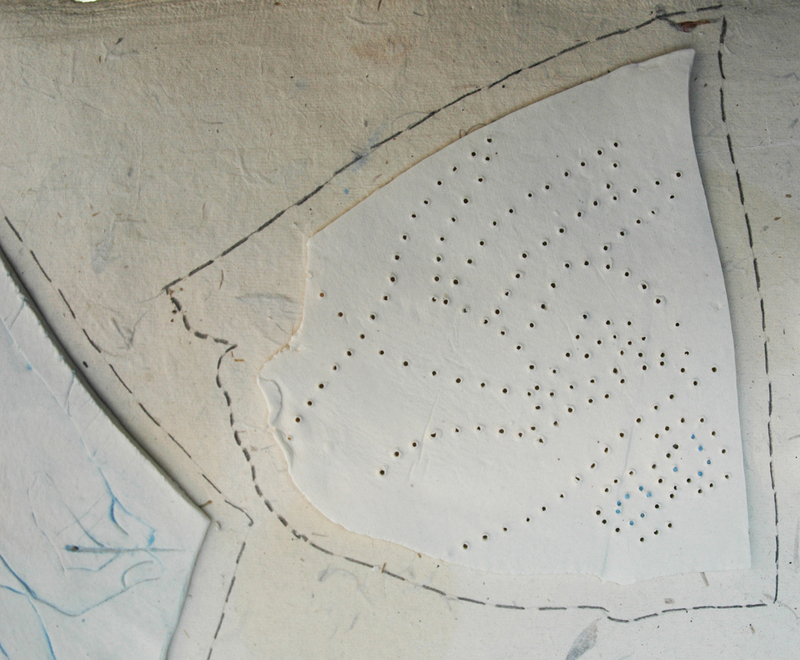 Then I can decide how big to make the dishes for the stencils and the shapes to impress into the surface – but even more importantly calculate the size of the holes I will eventually stitch. 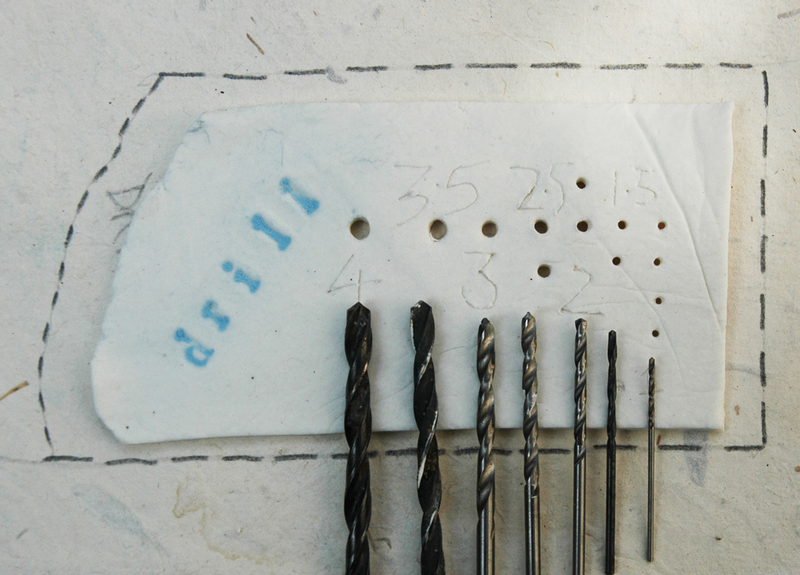 It appears that the smaller the hole the less it appears to reduce and after firing they seem to fit the next smaller size – so a 2.5 bit will now fit -just- into a 3.sized hole and as they all need smoothing with a file that seems easy enough. 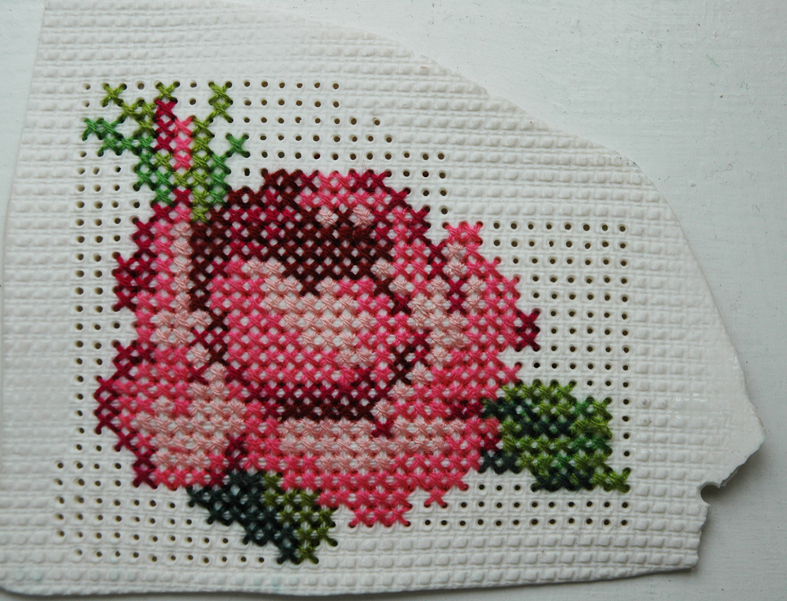 I chose to make most of the holes at 1.5 size drill bit and now this easily admits a medium sized crewel needle – a sharp pointed needle with a long eye for threading thicker yarns. 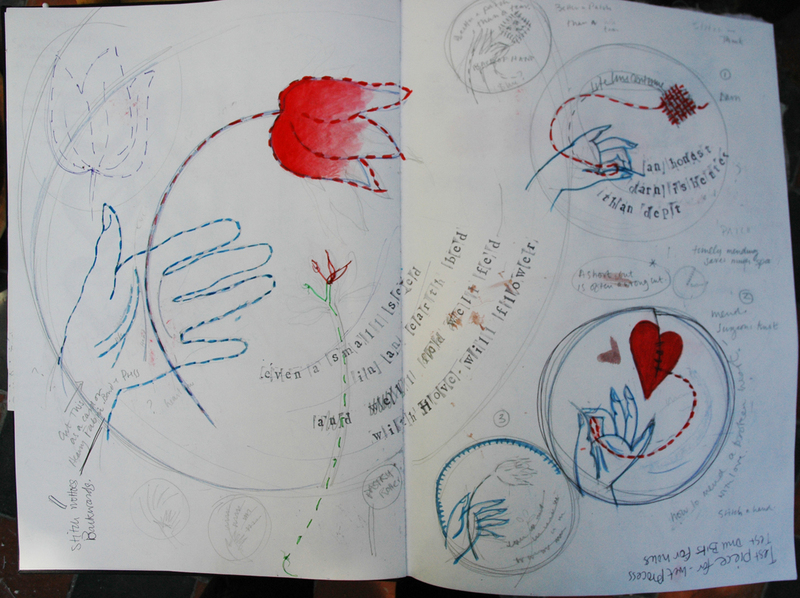 sketches for hands, flowers and mending broken hearts dishes. 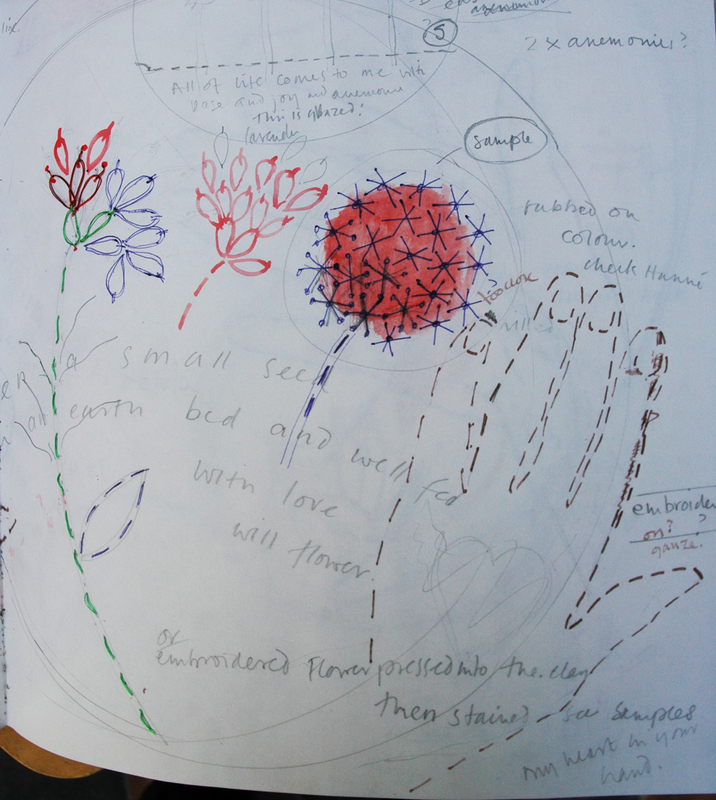 I made several pages of drawings for poems, mainly haiku on the subjects of flowers and hearts, written by a friend Rosemary Murphy, but also I liked the sayings about mending – now there’s a surprise! Anyway samples are made for the mending hands designs and the poems as this is the set of ideas that I have decided to develop into porcelain plates and dishes. 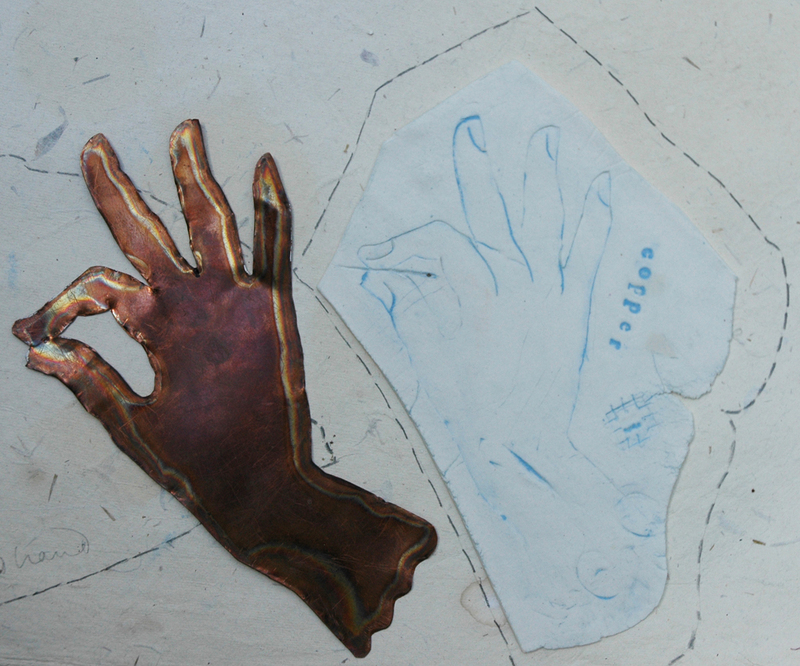 I also wanted to impress the hands as I had previously impressed the lace in the large sample plate – see first blog on Stitched Ceramics – so I used a hand that I had previouslycut out of copper sheet using my plasma cutter, this was adapted from my letterhead which I have used for over 20 years. I also am waiting for another cardboard hand impression to be fired to make a comparison between metal and card. 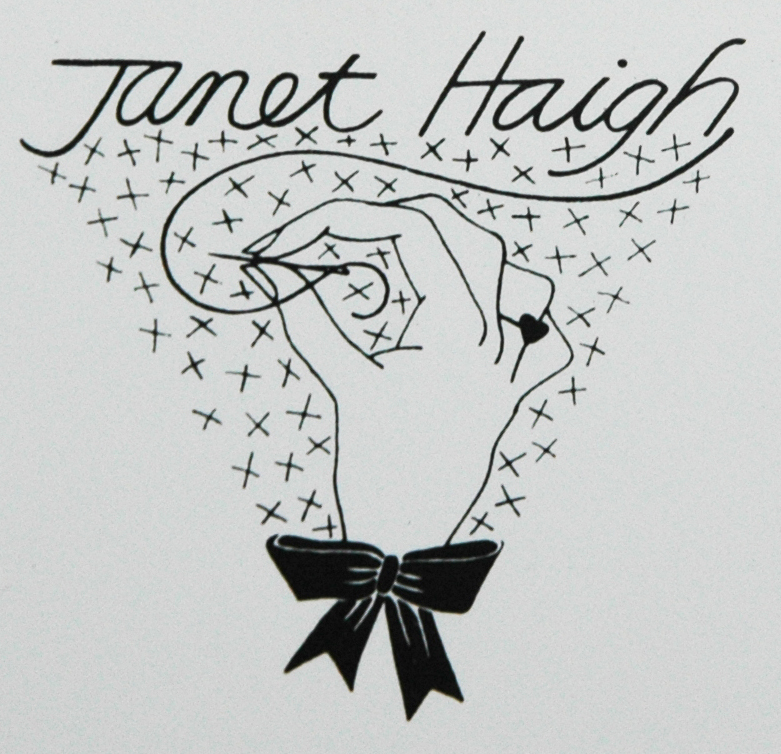 The impressed hand is coloured with pale blue powdered enamel so that the outlines are seen more clearly, I think that this colour relates to the embroidery patterns I have been using as references in some of my other stitched work. 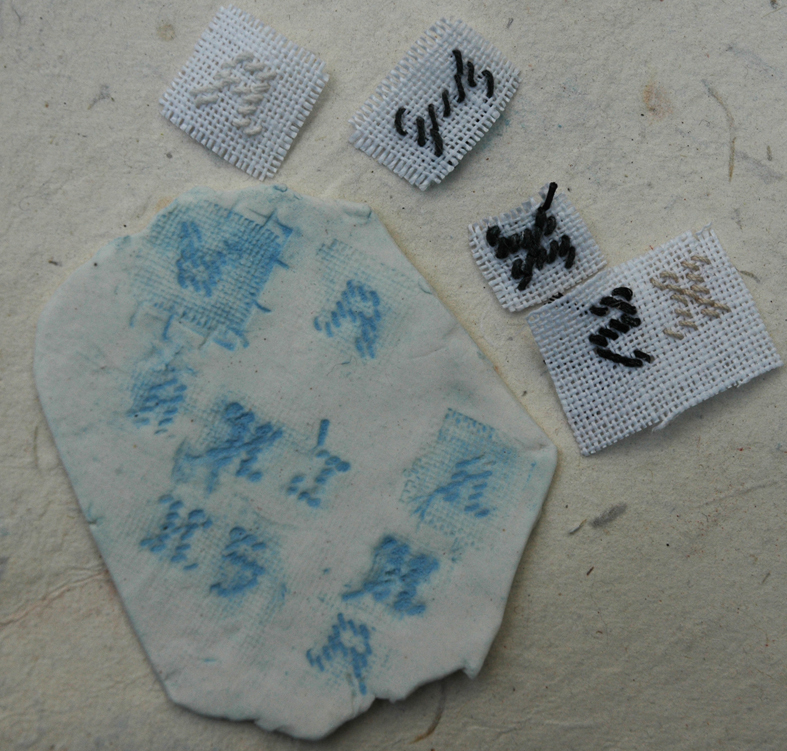 I am also considering how I want the lettering of the mottoes and poems written and below is a sample of a some stitched letters from a whole alphabet I had considered sewing in order to make individual stitched letter impresses, but they appear too indistinct at this tiny scale – I may return to this idea though for other works in porcelain or enamel. 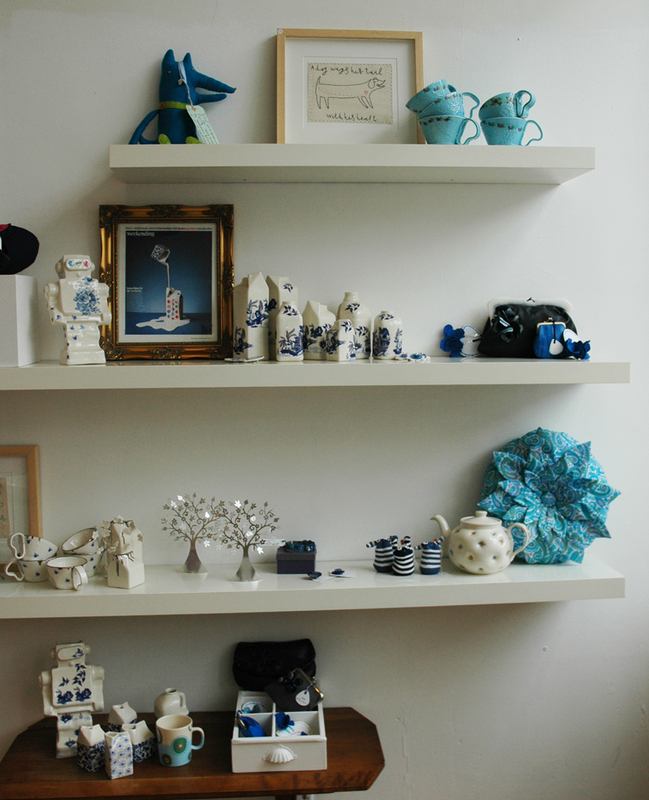 Categories: Drawing, Make - Do and Mend, Stitching Ceramics | Permalink. I am working with a ceramic designer, Hanne Rysgaard, as part of project, called Stitch and Think held for members of the ETC group at U.W.E. Bristol. 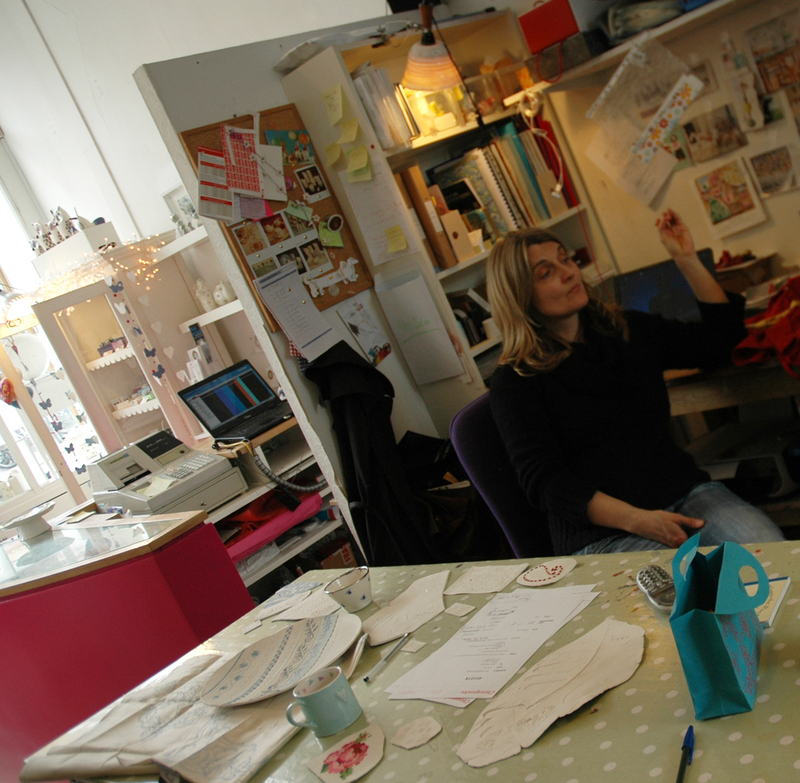 Hanne and I have formed a making partnership to help one another develop new stitched work. We are, in effect, acting as each others’ technicians but the resulting collaboration is helping to develop some new and interesting ideas for both of us. We are at the stage of selecting and sampling the main techniques and materials we both want to work with, she is helping me make large porcelain plates that I can cut, stitch and decorate with fabrics and words; I am giving her fabrics from my studio stash to impress into the clay or make into decals – eventually I will stitch her work for her. This is a good division of labour, we both get to play with new materials and ideas and we don’t have to take forever to become fluent in a new technique to get anywhere. 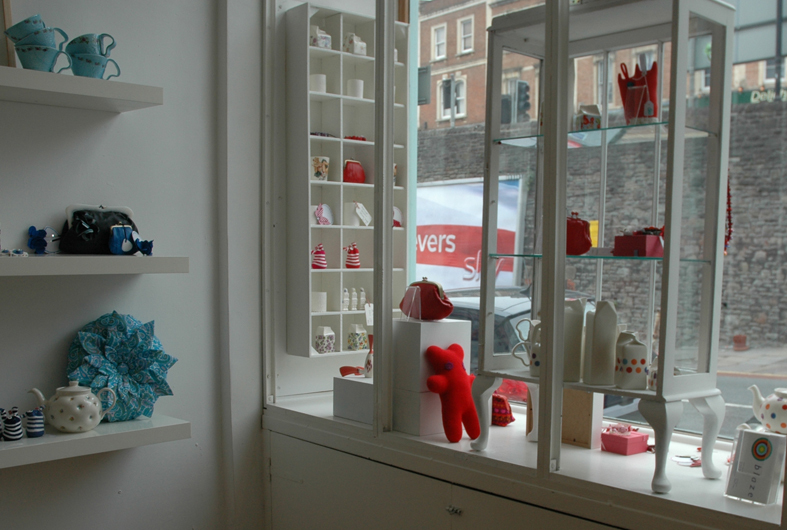 Last week I visited her at Blaze Gallery and Studio in central Bristol; it is co-operatively run with several people working on the premises and always shows fresh and innovative work including invited local makers. Blaze shop window and an inside gallery wall. 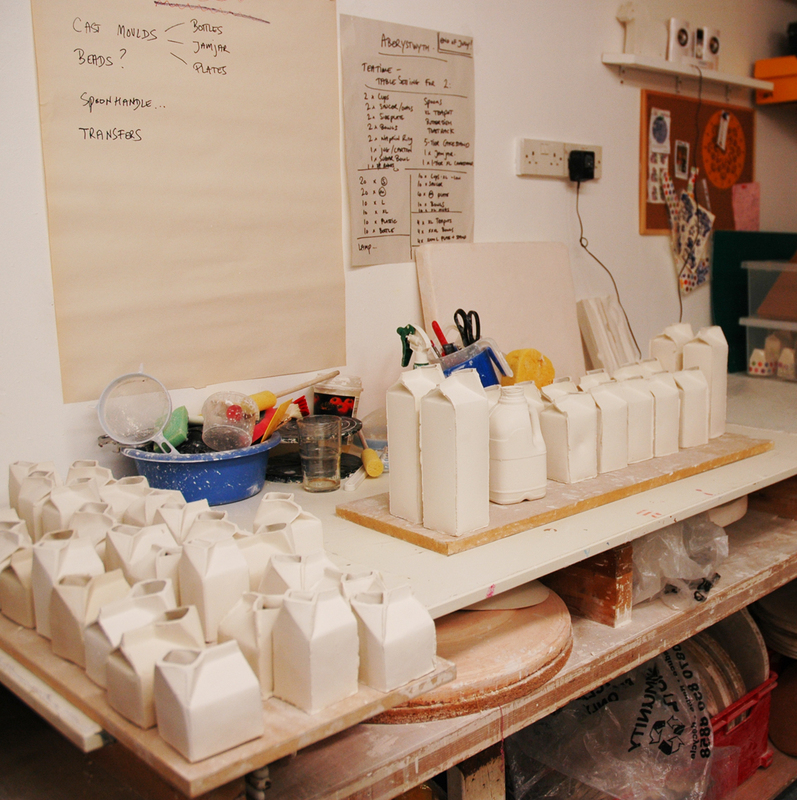 Below is Hanne’s workshop where she produces her ceramics to sell in the shop and various other outlets, at the moment these milk jugs are hot favourites when eventually wrapped in flower power designs or spots. I had taken her my first completed set of samples, 2 dishes and some embroidered pieces of porcelain and paper porcelain, we had made these some time ago at a previous workshop, and they were finally fired and stitched. On the table are several other pieces we are considering. Hanne looking not very impressed with my samples on the table in front of her. 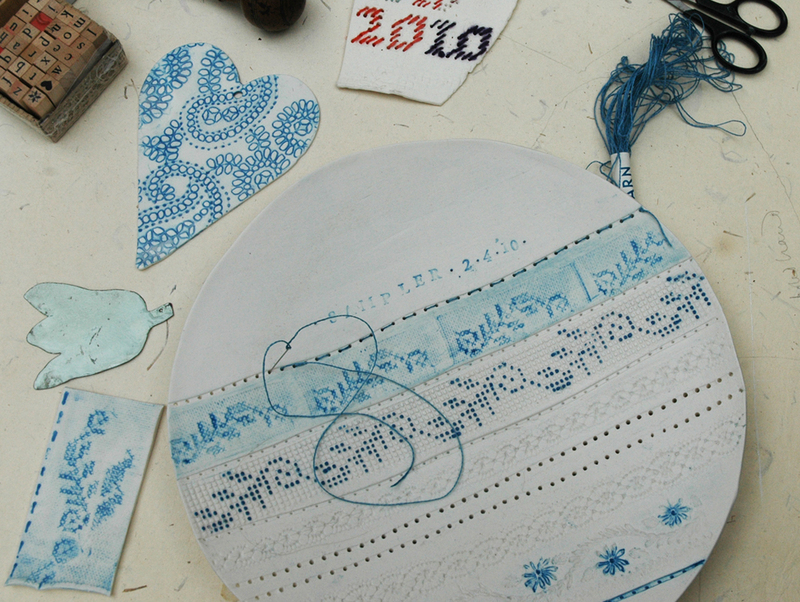 I have been working with the idea of vintage printed linen embroidery motifs which are folded under the plate, trying to recreate the light blue guide line for embroidery – here I have embedded some colour into the pressed clay and stitched the finished sample in a matching linen thread. 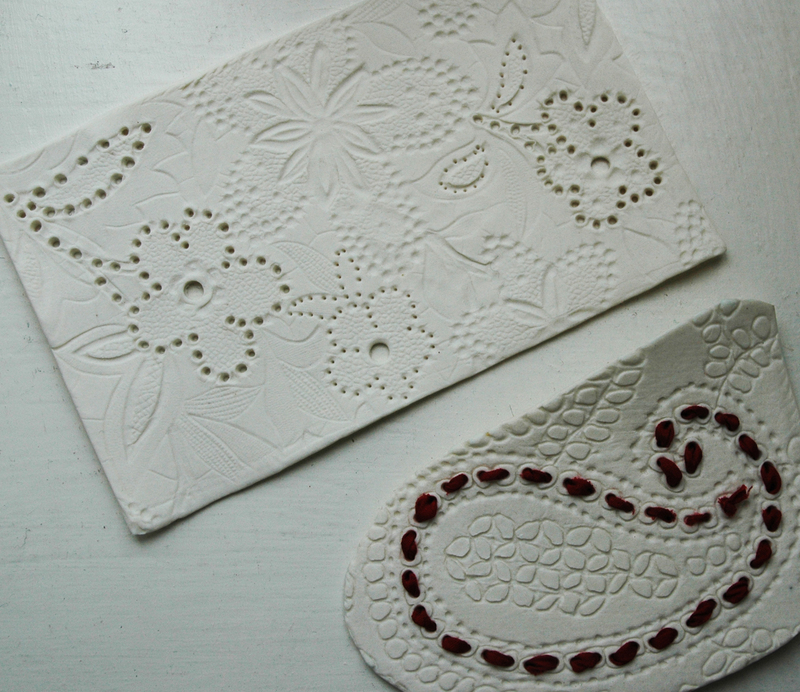 Below are more of our earlier samples of impressed and stitched paper porcelain. 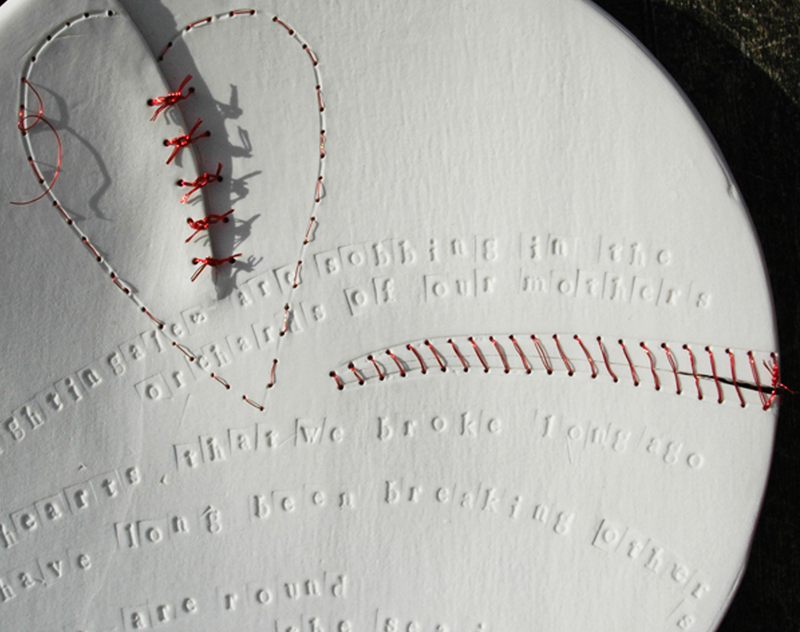 I made this plate which I cut, pierced and “mended” with red wire – it features a broken heart and one of my favourite poems by W.H. Auden. 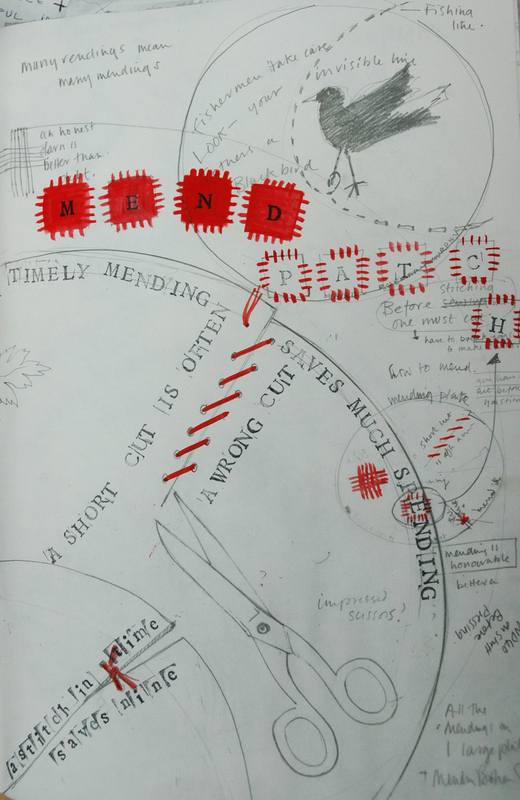 This week I am working on a series of drawings to develop a set of broken and mended plates based on this. I am also introducing images of working hands and “make do and mend” mottoes, so I will show more of this ongoing work when the new samples have come out of the kiln.